42' Wellcraft motor vessel | Christian & Co. The vessel was inspected while afloat. Hull construction material is fiberglass. Deck and above deck structures are constructed of fiberglass. Coring is unknown. Bulkheads are constructed of plywood. Overall condition of the hull structure appears satisfactory with no noticeable fractures or delamination of fiberglass tabbings sighted. Exterior rails and hardware appear good. Cosmetic condition of vessel appears satisfactory – good externally (cockpit has new upholstery and carpet), and satisfactory – good internally. Vessel’s external colors are white with purple boot stripe and purple and black upper accent stripes. Below waterline through hull fittings appear satisfactory except for the forward hull drain plug that is not included in the bonding system and does exhibit corrosion. The vessel is equipped with no manual and three electric automatic bilge pumps that appear satisfactory. The bilge is holding minimal standing water and there is some debris in the bilge below the generator. The ventilation system consists of two forced air blowers and natural ventilation and appears good. General housekeeping appears good. Engines’ external surfaces appear good and exhibit no significant corrosion. Engine hour gauge exhibits 650 hours (single meter). Motor mounts appear satisfactory. Cooling systems appear good but the port engine’s oil cooler exhibits a “pin hole” leak at the raw water connection pipe weld and its heat exchanger has moderate salt build up about the drain plug. Fuel systems and components appear good. Exhaust systems and components appear marginal – satisfactory as there is significant corrosion of the exhaust risers (more to the port engine’s risers). Electrical systems and components appear good. Engine control systems appear good, and shaft logs appear satisfactory. Steering control systems appear satisfactory and rudder ports appear satisfactory. Propulsion components were not inspected externally. Generator’s surfaces and motor mounts exhibit areas of corrosion with deterioration of the mounting frame/oil pan. Generator’s peripheral components and systems appear marginal as there is corrosion about the exhaust hose connection, the exhaust hose is deteriorated and there is salt build up and corrosion about the heat exchanger’s end cover. Waste systems and components appear satisfactory but the holding tank’s securing strap is broken. The shower drain hose is routed directly to the shower sump box instead of to a “t” connector that allows it to bypass the filter screen. There is an undetermined gallon capacity in two aluminum tanks located outboard of engines. Fuel tank surfaces, where visible, appear satisfactory with no significant corrosion sighted. The fuel fill, vent and feed lines and components appear satisfactory. Fuel fill to tank bonding (gasoline) appears good. Fuel shut-off valves are located on the engine compartment’s overhead aft of the engines. The AC shore cord, inlet and connections appear good with no significant corrosion or noticeable heat damage. The AC wiring and outlets appear satisfactory – good. The AC main feeds are protected with circuit breakers. Battery arrangement appears satisfactory. The condition of the batteries is beyond the scope of this inspection. Batteries are equipped with a disconnect switch. DC wiring appears satisfactory – good except there are exposed wires in the headliner to starboard aft of the salon where a light fixture has been removed. Circuit protection for the AC and DC branch system appears good. Wire terminations and connections appear satisfactory – good. Wire organization and arrangement appears satisfactory – good. Vessel has three portable fire extinguishers and one fixed fire suppression system that have not been inspected, tagged and maintained within the last year as recommended by N.F.P.A. The safety components include: at least 10 PFDs and 2 throwable PFDs; distress flares have expired certification; suitable first aid kit; 2 anchors with chain and line, and appears good. Navigational and anchor lights appear good except the aft half of the anchor light does not work. Other safety equipment includes remote controlled spot light, windshield wipers, dual horns and a gas fume alarm. The vessel was inspected at its normal slip location. Lines condition and arrangement appears satisfactory. Boarding hazards appear insignificant. All entry points were found locked. Other security consists of a gated marina. The vessel is a fiberglass production express cruiser equipped with twin inboard gasoline engines. 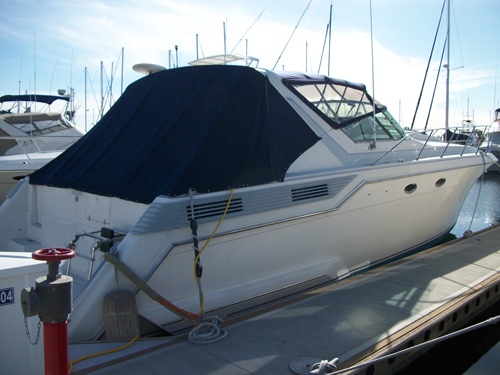 The client reportedly purchased the vessel in 1993 and has upgrades including new exterior canvas, new cockpit upholstery and carpet and new interior upholstery on the aft settees and a new GPS (not installed during the inspection). The vessel’s hull structure appears in sound condition and engines in good condition overall except for the exhaust risers that should be removed and inspected prior to use. The generator does exhibit significant corrosion about the exhaust manifold but the generator is not required for running the vessel. There is significant corrosion of the engines exhaust risers and they should be disassembled and inspected prior to use of the vessel. Upon completion of the recommendations, the vessel should be suitable for its intended purpose as a near coastal pleasure craft. ACTUAL CASH VALUE – $75,000 approx. NEW REPLACEMENT VALUE – $350,000 approx. 1. Disassemble both engines exhaust risers, inspect for extent of corrosion and replace if/as required. 2. Clean the port engine’s heat exchanger about the drain plug, inspect for corrosion and service if/as required. 3. Have a qualified mechanic inspect the generator and service as recommended including servicing of the cooling system and replacement of the exhaust hose. 4. Replace the securing strap for the holding tank as it is broken. 5. Clean corrosion from the forward hull drain plug, inspect for deterioration, service if/as required and include in the vessel’s bonding system. 6. Service/clean all sea water sea strainers. 7. Re-connect the drain hose for the shower to the inlet “t” connector at the shower drain sump pump. 8. Install a carbon monoxide alarm within the cabin space as recommended by A.B.Y.C. 9. Certify the fire extinguishers as recommended by N.F.P.A. and provide current distress signal flares as required by U.S.C.G. 10. Service the aft half of the anchor light to be working. 11. Secure the spotlight power wire to the bow pulpit. 1. The engine hatch cover is soft in the center. This may be due to deterioration of coring and should be accessed and repaired if/as required. 2. There is salt build up about the macerator overboard discharge pump. Monitor for any leaks and service if/as required. 3. Waste hoses exhibit salt crystalline on surfaces indicating they are nearing the end of their serviceable life. This survey sets forth the condition of the vessel and components, as specifically stated only, at the time of inspection and represents the surveyors honest and unbiased opinion. The submitting of this report should not be construed as a warranty or guaranty of the condition of the vessel, nor does it create any liability on the part of Christian & Company or the individual surveyor. No part of the vessel was disassembled or removed and no assumptions should be made as to the condition of concealed components. Specifics were obtained from sources available at the time of inspection and are believed correct, but are not guaranteed to be accurate. This inspection was performed for the expressed purpose of obtaining insurance, and should provide the information necessary for underwriting purposes, if any additional information is required, please contact the undersigned. This survey report is not intended for use as a “buyer’s survey”.